FANBOY PLANET.com . : mc-brandonmolale :. After years of attending Comic-Con, I've managed to learn enough composure to not really have any geek out moments. 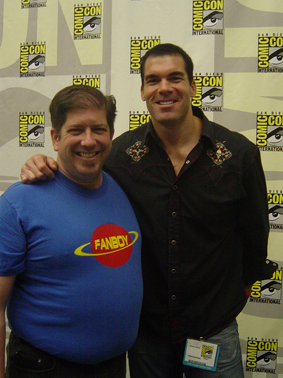 Yet this year I reacted with incredible force upon being given the chance to interview Brandon Molale. We talked about Brandon a little over a month ago, upon discovering that he was in the running to play Captain Marvel. His publicist refers to him as "attached." Brandon takes it with more humility and realism, knowing that anything can happen -- and we hope it probably will. The day before I was to interview him, he happened to stop right in front of the Illusive Arts booth. I ran around the table to introduce myself, and couldn't stop being geeky. This guy could be Captain Marvel. 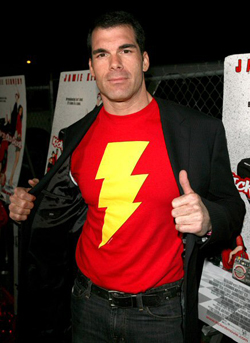 This guy should be Captain Marvel. Brandon Molale: I like that enthusiasm. That's what we need. Good, positive, yes, man, fanboy enthusiasm. Derek McCaw: So tell us what you know. You've been in talks for some time? What's going on with this? Derek McCaw: Ah, so that's where I get confused. Yeah. That was it. Brandon Molale: Thanks for hiring me, by the way, Shaun. Shaun hired me because of Mr. Deeds. He said "I love that character absolutely. " And he put me in his movie. Brandon Molale: Absolutely. Adam Sandler cast me. You guys know me as Kevin Ward, the big, foul-mouthed redneck jerk quarterback in Mr. Deeds - "no, daddy, nooooo!" That was the first ever movie, Derek, that I got cast as an actor in. That started the whole train rolling, and that was back in 2001. Brandon Molale: I started out as a non-union extra in this business, like everybody else does. You've got to start out at the bottom and work your way up to the top. That's how I got started, and that was my first big break in Hollywood. Derek McCaw: You worked with Peter Segal on The Longest Yard. Have you been talking to Peter at all, slipping notes under his bed late late at night? Calling up whispering, "Pete! Pete! 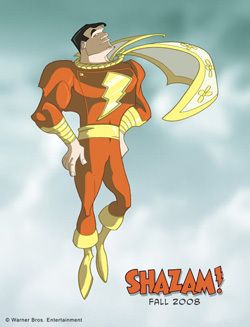 Shazam!" Brandon Molale: (laughs) I won't go that route. I want the fans out there to say this is the guy (they) want. Brandon Molale: Who wouldn't want to be the Big Red Cheese? Are you kidding me? Come on, it's Captain Marvel! Brandon Molale: It's America's Mightiest Mortal. Fans. This is your Captain Marvel right here. I'm ready to step into the boots. Derek McCaw: So you've been reading the books now. What has appealed to you? Anything surprise you about the character? 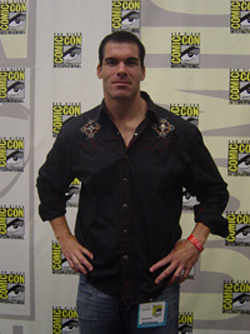 Brandon Molale: I like how people have different takes on him. I really like Alex Ross' side, what he has to come up with. Jeff Smith, I believe, has another take. Brandon Molale: There's so many ways to have him. I just like that he battles Superman, because who doesn't want to see Captain Marvel take on the Man of Steel? That's a classic! Brandon Molale: It is. I feel right at home. My head's on a swivel 24/7. You can't walk down this monstrosity. If you're not here at Comic-Con, you have no idea how big it actually is. And when you're walking around…my head is like…my neck actually hurt after yesterday. I told my woman I have to stop looking around. I have to focus on staying straight ahead. There's just too much to see here. Brandon Molale: The people passing out postcards with me on there. It's my face saying Brandon Molale for Captain Marvel. That really shocked me. It left me in a stupor. I have some really great fans out there, and thank you, guys, for showing the support over the years. It's amazing. Just walking up here into this room, people stopped me and said, "Hey, Brandon, my name's so-and-so, I'm all for you to play Shazam, I hope you get the role." It's very flattering. Derek McCaw: That's really surprising you. You had no idea how much fans want you to be Captain Marvel? Brandon Molale: The outpour and the response is amazing. I've had a lot of people since April of last year contacting me through my site, saying "hey, Peter Segal's doing this movie, what are your thoughts?" I mean, my thoughts, I had no idea what it was about. They'd say "you should play Captain Marvel." I'm like, "okay, well, absolutely. But that's the first time I've heard about it…"
I get emails from people all the time asking what's going on, what's going on. All I know is that my reps deal with all my contracts. I just come in. If you've got a contract right now, let's sign it! If they ever bring back Fat Billy, I'm there! Brandon Molale: John August, the screenwriter who did Charlie and the Chocolate Factory, he's writing the script right now. All I know is what I read. So your guess is as good as mine. Derek McCaw: Let's hope our guess is better. Okay. I'm going to give you a dramatic reading right now. Just change back to Billy Batson. You know what to say. Say it. But I wouldn't say that. Billy says that. Brandon Molale: I'm actually eight and a half. I got into acting and wanted to be an actor because of Tom Hanks. I was floored by his performance in the movie Forrest Gump. For myself, walking out of the theater, I was so emotionally touched. I couldn't believe this gentleman's performance had this profound effect on me. I was in awe of what he had just done to me as an actor. And I said to myself I want to do that to other people. I want other people to walk out of movies seeing what I did and let that touch and affect them. So I can honestly say that Tom Hanks is one of the major reasons why I got into acting. So if they want to go the route with this script, kind of like a Tom Hanks' Big where he had the conflict of growing up, does he stay this gentleman or go back to being the thirteen year old child? I love the concept of it. I think it's fantastic. My inner geek and inner child - that's me. I'm the guy who has every G.I. Joe figure that was ever made, with the straight arm, non-swivel. I still have those in storage. I never got rid of them. I am the inner geek. I'm ready to do this! Brandon Molale: I walk amongst the geeks. But I'm six five, so my head hovers a little above the crowd, but I still walk amongst. Derek McCaw: We've got a lot of six fivers, just not in such good shape, quite honestly.